Humankind’s home is in the wild. It’s where we spent our formative years. Even today, well after the advent of civilization, industrialization, and computerization, almost half of humanity still lives in rural areas . That close relationship to the land is probably why green  and blue spaces  offer so many health benefits, like lower stress and improved immunity. Going for a hike or picnicking on the beach is much like going home. Yet we don’t simply exist in nature. We shape it. We’ve always shaped it, from ancient Amazonians building food forests  to Neanderthals offing entire herds of mammoths at a time . We start fires, systematically hunt and consume its inhabitants. We make gardens—blends of nature and culture. In effect, we impose our will. I’ve suggested you camp  in the past. I’ve encouraged you to hike . I’ve even told you how best to optimize your hiking . I’ve described the myriad benefits of spending time in nature . Today, I’m going to discuss how to interact with nature without destroying it. How to dig into it, meet it Grok-style. How to feel at home in your true home. Always shirtless and slightly grey from clay residue, the anonymous star of the Primitive Technology YouTube channel  has been making huts, tiles, tools, weapons, ovens and other technology using handmade tools and natural materials gathered in the Australian bush for several years. His instructional videos are well-shot, with no talking and no music. Enable closed captions for added details. He even figured out how to make iron  last year. This is a good all-around axe for chopping wood . It also turns out to boost testosterone . Carrying water is optional. Look for foraging groups on Meetup  or Google. Grab some foraging books  from the library or Amazon. Be sure they apply to your area. Be careful, of course. But don’t let caution paralyze you. I suspect we won’t see very many more Christopher McCandlesses . The breadth of and access to wild food knowledge is too great. We can certainly get by without direct exposure to fire, but I don’t think we should. Fire burns within us, and I’d argue within our very DNA. It’s why fire engrosses us  and the campfire can coax stories  and good conversations from those who gaze into it. Cooking is the most powerful and primal way to interact with fire. You’ll want a portable grill. This portable Tuscan grill  is the best widely-available option I’ve seen. It’s a 14×14 cast iron grill with legs that screw on. You can plunk this thing down directly over embers, or remove the legs and lay it across an existing grate. Buy two or more to boost your cooking surface. You’ll want a large cast iron pan. Francis Mallmann, an Argentine chef featured in Netflix’s Chef’s Table (watch the trailer of his episode , then go watch the actual episode), suggests a chapa—a large cast iron surface about 30 inches by 30 inches set on legs for placing directly over embers. Get one of those if you can. You’ll likely have better luck finding extra-large cast iron griddles . 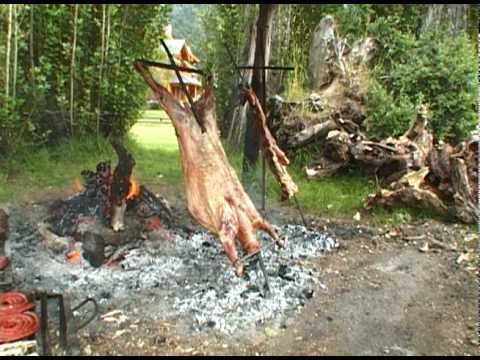 Mallmann also roasts whole lambs and pigs on the Patagonian cross , a 6 foot tall vertical piece of iron with two parallel crossbars and a sharpened end that sticks into the ground in front of the fire . If you’re really gung-ho, find a metal shop near you, draw up some plans, and have them build exactly what you want.